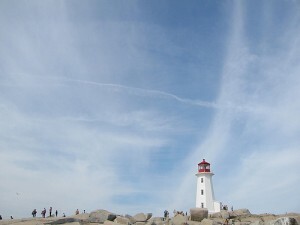 Big blue skies above Peggy's Cove. Here’s all the practical information you need to plan your Nova Scotia trip. Learn what Nova Scotia’s weather is like across the seasons and what’s going on each month, from typical temperatures to favourite activities. See our itineraries, advice on what to pack and learn which public holidays we celebrate in Nova Scotia. We also have guidance if you’re a disabled traveller. If you’re coming from New England or a nearby province, chances are you’ll arrive by road or take a ferry to get here. From much further afield, you’re most likely to take a flight into Halifax’s international airport. A car is the best way to see Nova Scotia but you could also travel by motorbike, RV, public bus, shuttle bus or by train. Adventurous folks can ride a bicycle from town to town. Canadian dollars are the official currency, although U.S. dollars are often accepted. And don’t forget about your budget. There’s plenty to explore when it comes to local foods and drinks, including some great wines. Learn about the Bluenose II schooner, why Nova Scotians are called Bluenosers and see a list of movies set in Nova Scotia. The internet is the easiest way to keep in touch while you’re in Nova Scotia.